Thunderstruck II is the follow up game to the ever popular original Thunderstruck slot based on Thor, the Norse god of thunder. The difference is Thunderstruck II boasts enhanced graphics and sound effects, including a huge 243 Ways To Win, and fun bonuses. Thunderstruck II is available on PC and mobile formats making it one of the most popular online pokies available to play today. When you have a spin you will come across heroes and heroines of Norse legend and symbols include Thor, Loki, the god of mischief; Odin, the ruler of Asgard; and Valkyrie, the guardian of Valhalla. 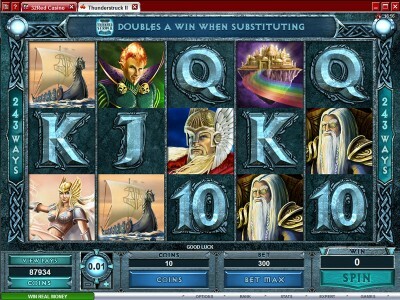 Other pokie symbols include Asgard, capital of the gods; and one of a Viking longboat at sea. The bonuses in Thunderstruck II Australian pokies are quite incredible. First of all theThe Thunderstruck II logo acts as the wild symbol and substitutes for all others. The main aim when playing is to hit 3 ore more hammer symbols to gain access to the Great Hall of Spins. Each Norse god has his own chamber in the Great Hall, the more you play and win the more Gods will be available to select. Each God has their own number of Free Spins with multipliers, Wild Magic features and Wild Raven features along with Rolling Reels. This all creates an exciting and addictive playing environment where the bonuses really do lead to some huge payouts! Your progress is saved the more you play in the Great Hall of Spins. Among online players Thunderstruck II ranks very highly. The theme of Norse gods and goddesses, 243 Ways To Win, Great Hall of Spins delivers something to delight every online slots player.